As always with a curry, the list of ingredients is big but the end result is very flavoursome. And it’s very easy to make! Dry-fry coconut in large frying pan over medium heat, stirring, until browned lightly; remove coconut from pan. Dry-fry cinnamon, cloves, chillies, turmeric, seeds, peppercorns and star anise in same pan, stirring, about 1 minute or until fragrant. Blend or process coconut, spice mixture and garlic until fine. Heat ghee in large saucepan; cook onion, stirring, until onion softens. Add coconut spice mixture; cook, stirring, until fragrant. 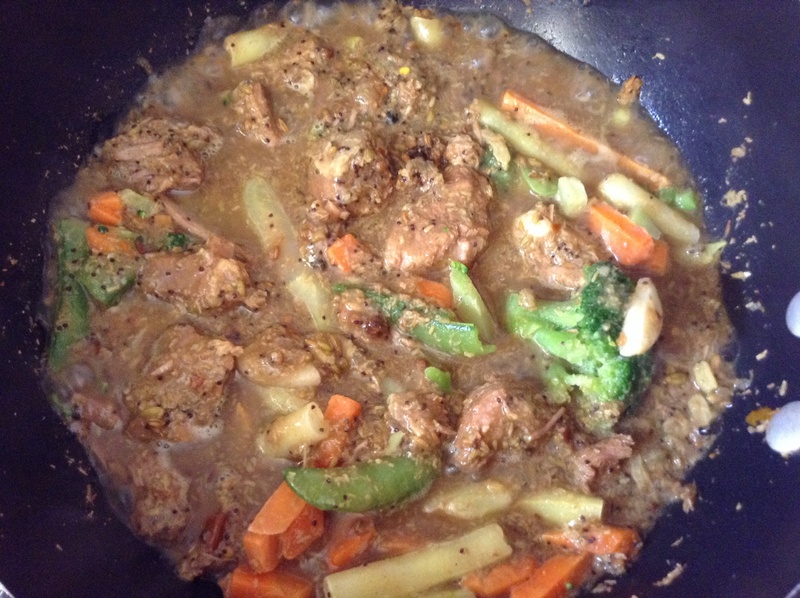 Add beef; cook, stirring, about 2 minutes or until beef is coated with coconut spice mixture. Add the water and stock; simmer, covered, 30 minutes, stirring occasionally. Uncover; cook 30 minutes or until beef is tender and sauce thickened slightly. Stir juice into curry off the heat; sprinkle with fresh sliced chilli if you like. I used chuck steak instead of rump. Make sure you GRIND the spices with the coconut as opposed to “blend or process”. I got quite a few pieces of cloves, star anise and chillies left in the curry, which is not really nice. I also cooked the curry in the oven in a large casserole dish. I started the oven at 170°C for an hour and then I cooked it for 2 more hours at 150°C. There was a lot of liquid left. So I waited until the next day when it was cold (and it’s always better to eat a curry the next day anyway) to skim the fat of the top and then put it in the fridge. The meat and liquid then thickened. I added vegetables when I reheated the curry and cooked it a bit until the curry was quite dry, and then I added the lime juice.